Now a day's all things are going online ,all engineers are works on how to put their coded works online as a Internet apps. 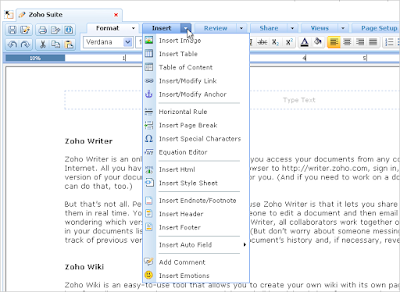 Zoho writer is an online tool that let's you write a styles documents,it's a comfortable, totally free and easy in use. 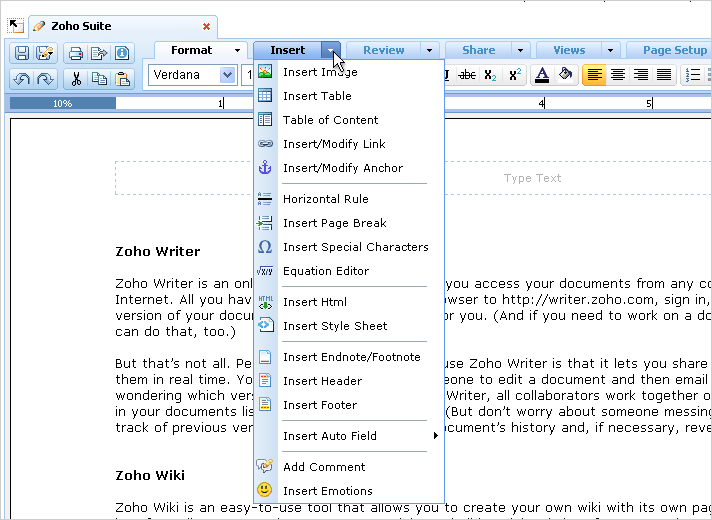 Zoho writer having intuitive toolbar with menu items neatly grouped in context based tabs. It having WYSIWYG friendly editor,you can see it under a format tab,choose various fonts apply size too.create headings,highlight colors and Format text with bullets, numbering, indents. Under insert tab you can find options for inserting images,tables,links,horizontal rule,page break,special characters,Html,comments and emotions etc. you can easily spell check your document in 75 languages and Lists all the versions of a document. Compare any two versions of the document and find the difference between them and also chose various templates for your document. share your document ,publish it in to your blog directly,email it and make it to draft also. Their are also chat option provided where can you chat with your Buddy's and edit your content by discussing.